I read a ton here in Haiti. Blogs, books, articles, random magazines i find down here from the 90's. I gave up TV a few years ago but still watch an occasional movie. I's rather be lounging around reading a book than watching TV or a movie any day. Here I read a ton of books on my Kindle. Mostly I get the free ones b/c let's face it...when you read several books a week it gets pretty expensive. I came across a book a few weeks ago that I couldn't put down so I want to share it with you so you can read it too. 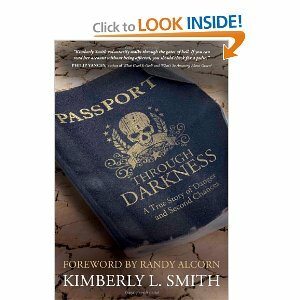 It's called Passport Through Darkness: A True Story of Danger and Second Chances by Kimberly L. Smith. Yes it's a Christian book that has a few corny parts, I'll admit. But overall, it is fantastic! Best of all it is a true story of sacrifice, courage and putting trust in the Lord on a day by day basis-even when you feel like He is not there anymore. Kimberly Smith is a missionary who has a family but struck out on the field on her own while her husband held down the family and mission forts stateside. The ending was truly a surprise that I didn't see coming and her grace in dealing with it is amazing. I really really want you to read this book. So much that you can click on this sentence for the link to buy it on Amazon. Or this sentence for the Kindle Edition. And after you read it come back here and tell me what you thought!